Mr. Wood has to listen to us sing. All of us. Carmelita probably has the most powerful soprano in the school. Even Travis, who got his head stuck in a chair, has a strong tenor voice. Jasmine could probably make it on one of those singing-contest shows on television. Me? I croak. I gobble. I squeak. Mr. Woods says to me, "Just hum, Sassy, and enjoy the music." Sassy loves music. But she knows she can't sing. Her sister Sadora sings like a lark. The only bird Sassy sounds like is a crow. But she has discovered a way she can make beautiful music. Hidden inside her fabulous sequined Sassy Sack, along with everything she or her friends could ever need, is her silver secret, a shiny piccolo that Sassy has been learning to play for the last year. There's no school orchestra, so Sassy doesn't know what her classmates would say about her playing the tiny and unusual instrument, so she keeps her piccolo in its tiny case deep in her Sassy Sack. But then Mr. Woods announces that the fourth grade choir is going to stage an original musical about saving the planet, and--the principal singers and dancers will wear gorgeous sequined purple costumes. Sassy longs to be wearing one of those dresses, but she knows she stands no chance of getting a singing part. Then Mr. Woods gives her a job as stage manager. Soon her Sassy Sack is filling up with varied markers to color-code the scripts, safety pins for emergency costume repairs, and a bunch of iPods loaded with everyone's music. Sassy loves prompting from the wings and giving cues to the curtain pullers and the sound and light guys in the control booth through her headset with its own microphone. Mr. Woods is very pleased with her organizational abilities, and the show is shaping up, especially the show-stopping finale, with Carmelita and the full chorus belting out "What A Wonderful World" while a video of beautiful scenes is projected behind them. Sassy loves that song and asks her piccolo teacher to play the song on the piano, and she discovers that she can play along completely by ear. Mrs. Rossini is amazed and tells her she has a rare talent. At last Sassu sees that she is a real music-maker even if she can't sing onstage. The weight of that little silver piccolo in her Sack somehow gives her extra confidence as the big night approaches. But then, after a great performance by everyone on opening night, disaster strikes when it's time for the final chorus to swing into "What a Wonderful World." Sassy whispers into her mike for Bill to cue the music. "Cue the video," I say. Beautiful pictures of the rain forest and the oceans fill the screen behind the singers. The choir sounds glorious. It's almost time for Carmelita's solo. I hurriedly whisper into the mike, "Loop the music and the video. We're missing a soloist!" Carmelita is too sick to go onstage. Does Sassy have something inside her Sassy Sack to save the big number? Sharon Draper's latest, The Silver Secret (Sassy) (Scholastic Press, 2010), brings back her spunky heroine with a perfect "the show must go on" adventure. 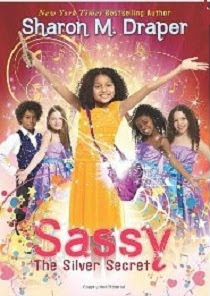 Sassy is a great character, upbeat, resourceful, and open to experience, and this one is a worthy addition to the series, which includes Little Sister Is Not My Name (Sassy) and The Birthday Storm (Sassy), all perfect fare for the elementary reader. Storybook Tea Kit Company is looking for youth literature space that we can partner with and do contests/giveaways.